Pichelsdorf is a small village with a church and a number of farms. 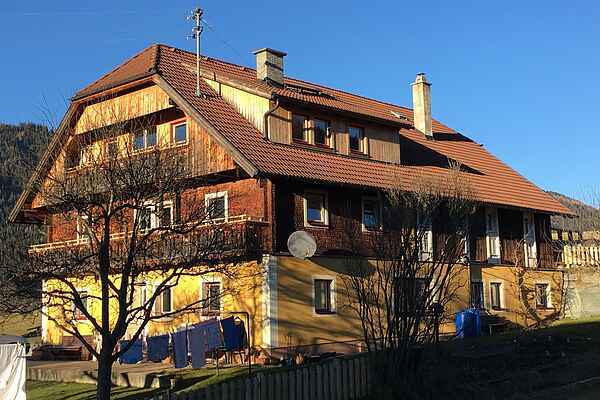 Pichelsdorf is located in the beautiful Lungau between St. Margarethen and Mauterndorf, from where you can reach the ski resorts of Aineck Katschberg and Grosseck-Speiereck in just a few minutes by car. If you love peace and quiet, and want to come home after an active day in the snow, this is the perfect accommodation. And also in summer you can enjoy the pure nature or a day of golf on the lovely course in St. Michael. The apartment is furnished above the owner's house in this old farmhouse. The three bedrooms and bathroom are located on the first floor and are very tastefully decorated. On the whole second floor the living space is set up with a luxurious kitchen and dining area. The open fire is central, guaranteeing a warm atmosphere and the very large living room has a view from the balcony over the ski piste of Aineck. From outside you can enjoy the quiet and the nostalgic appearance of this old farmhouse. Indoors you can enjoy the tasteful and luxurious decor.